British (English) novelist. An author most associated with Shropshire. Her works include 'Precious Bane' and 'Gone To Earth'. ALS. 1p plus integral blank leaf. Spring Cottage, Lyth Hill, Shrewsbury. May 11th [no year]. To [St John] Adcock. 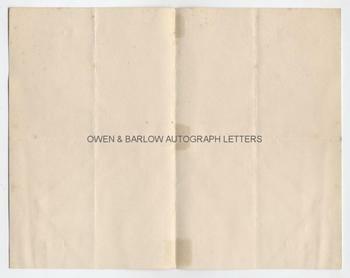 "Many thanks for your letter. Messrs Hutchinson are publishing my novel 'The House in Dormer Forest' in England. I have just corrected the typescript for Mr Brian. I shall be so pleased to send you a copy of my first attempt at a book, but it is not real Christian Science, only a nature lover's groping after some sort of truth and beauty. Messrs Curtis Browne are sending this round or posting it for me. Yours sincerely, Mary Webb". 8vo. Approx 7 x 4.5 inches. Traces of old mounting hinges to edges. VG. 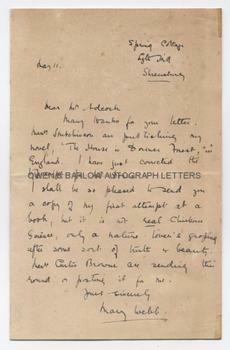 Mary Webb published 'The House in Dormer Forest' in 1920 and so this letter must date from around 1919-1920. Arthur St John Adcock was an author and the editor of 'The Bookman'. He is principally known as being the man who "discovered" the poet W.H. Davies. Mary Webb's fame was largely posthumous and she only met with popular acclaim after her death, when Stanley Baldwin praised her books. The depiction of rural life which Mary Webb became known for was parodied by Stella Gibbons in her novel 'Cold Comfort Farm'. 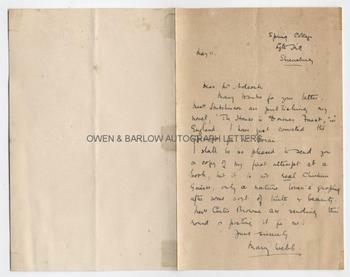 Autograph letters of Mary Webb are rather scarce.